As the most central and prominent feature of the face, the nose is pivotal to both appearance and personal identity. The goal of a Toronto rhinoplasty (nose job) should be to focus on creating a nose that suits one’s face and personality and looks natural and aesthetic. With his extensive expertise and experience, board-certified facial plastic surgeon Dr. Ashlin Alexander appreciates the delicate details of reshaping a nose. 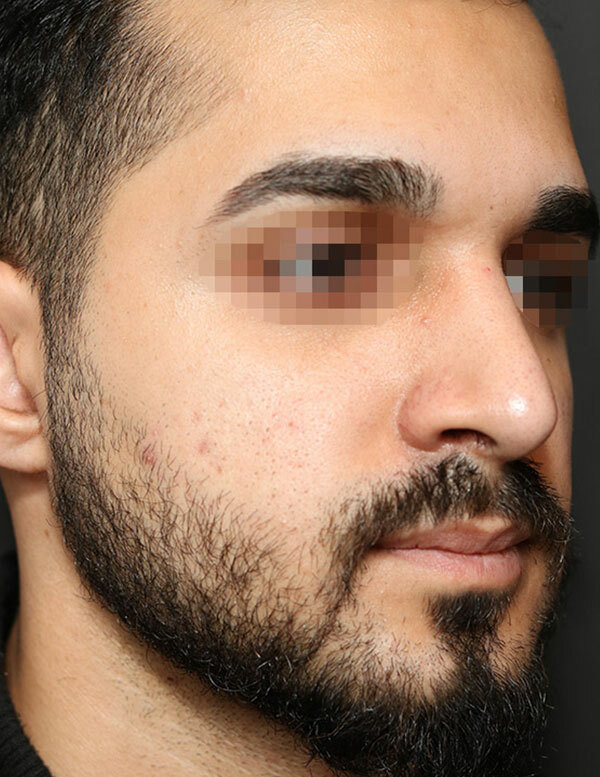 He is well versed in both endonasal (minimally-invasive) and open rhinoplasty, as well as non-surgical techniques (“liquid rhinoplasty”). Dr. Alexander is able to choose the approach that will give you the best result resulting in arguably the best nose job Toronto has to offer. Instead of applying cookie-cutter solutions, Dr. Alexander prides himself on the extensive time and meticulous planning he devotes to every Toronto rhinoplasty evaluation. His skill and expertise, coupled with a genuine, compassionate demeanor and true ability to connect with his patients’ wishes, have earned Dr. Alexander the reputation of providing among the best nose jobs in Toronto. Rhinoplasty is my favorite operation. The joy and satisfaction that comes from giving someone the nose they have always wanted, the nose that reflects their true identity, is a wonderful feeling. While some surgeons might get bogged down by the minute intricacies of a case, this is my happy place. It’s getting caught up in those details, in achieving that perfect, natural result, that I feel most satisfied in my work. Who is a good candidate for rhinoplasty in Toronto? Ideal candidates for nose surgery generally experience issues with the nasal bridge, the tip, the nostrils, or some combination of all three. Additionally, many patients will struggle with functional difficulties such as breathing impairment from a deviated septum. If you have suffered from a poor self-image and low confidence because of your nose, rhinoplasty may be able to improve your quality of life. Dr. Alexander recommends for younger patients that a nose job in Toronto is put on hold until the nose has finished growing, which usually happens by age 16. On the opposite end of the spectrum, there is no upper age limit for a nose job; however, all patients must be in good mental and physical health to undergo surgery, with no significant medical issues. 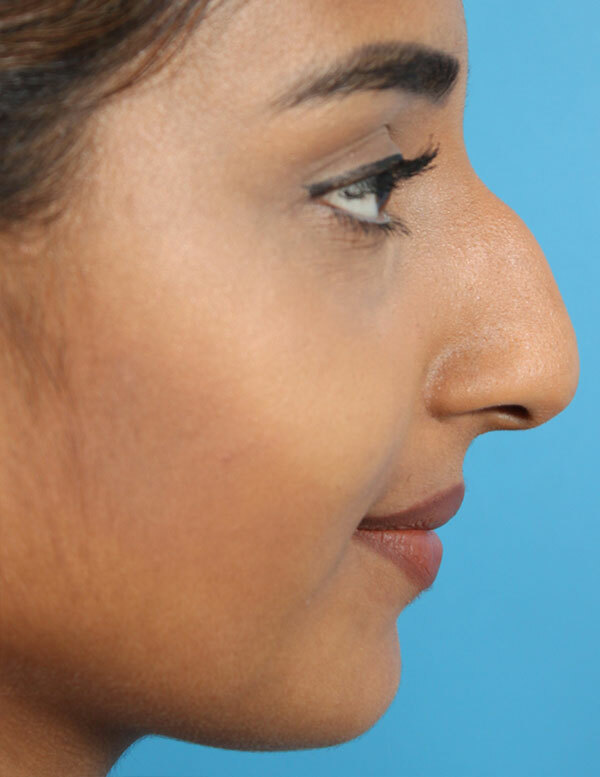 It’s important that rhinoplasty patients have realistic expectations for their surgery. The nose can be greatly improved, but perfection can be elusive. During your consultation, the doctor can provide you with computer imaging results that will reflect your results. These can be adjusted to your liking with the doctor’s help so that both surgeon and client arrive on the same page regarding the outcome of the surgery. Nose jobs typically take 3-4 hours to perform as it is a meticulous operation. Surgery will involve the manipulation of nasal cartilage and bone to remodel the shape of the nose. Nasal grafts may be employed for re-contouring when necessary. If the profile is weak, the doctor may recommend chin implant surgery at the same time as your Toronto rhinoplasty to provide optimal facial harmony and balance. Prior to surgery, the doctor will choose either an open or closed rhinoplasty, depending on the type of changes that need to occur. During the open surgery, a small columellar incision is made at the base of the nose to give the doctor the most efficient access to the underlying nasal structures. The scar from this incision typically heals beautifully and becomes imperceptible. A closed rhinoplasty involves incisions made inside the nostrils, resulting in no external scarring. Dr. Alexander is highly experienced in both approaches, and will recommend to you the best approach for your nose during your consultation. While each patient will heal at a different rate, most clients will experience expedited healing without complication, thanks to Dr. Alexander’s conservative, expert technique. You may be dressed with a splint, but this will be removed in about 7 days along with your sutures. Swelling and discomfort are all normal and to be expected in the early stages. Patients can usually resume most regular activities within 7-10 days. Swelling and bruising will be much improved by 2 weeks. If you have any questions during your recovery period, do not hesitate to contact Dr. Alexander’s office. You will also be able to check in with him during regularly scheduled follow up appointments to ensure that healing is going according to plan. Choosing the best plastic surgeon for your rhinoplasty in Toronto can be a daunting task. Dr. Alexander is compassionate towards those that feel apprehension, and he understands that trust is earned gradually based on transparency, integrity and reputation. Dr. Alexander has completed many prestigious residencies and fellowships, including a facial plastic surgery fellowship at New York University in Manhattan, where he honed the art of rhinoplasty, performing sophisticated, intricate surgeries under the tutelage of the most respected surgeons in the world. Dr. Alexander brings this consummate skill and seasoned technique to his Toronto patients as a board-certified facial plastic surgeon. As with your initial nose job, there are two general approaches during rhinoplasty surgery: the closed rhinoplasty, and the open rhinoplasty. The closed approach consists of incisions made within the nostrils, thus hiding any scarring from view. The open approach favors a single minor incision at the base of the nostrils, which does leave a scar, but Dr. Alexander does his best to minimize this through careful placement. Tissue grafting is often a major component of a nose job. Cartilage from other parts of the body must be harvested and transferred to the nose to compensate for nasal deformities. If a cartilage graft is required, Dr. Alexander will borrow cartilage from the ears or ribs to augment the nasal structure to provide improved form and function. Additionally, the doctor may opt to employ dermal fillers such as Restylane, Juvederm or Radiesse, all of which can be instrumental in addressing asymmetry and other aesthetic imbalances. Thanks to Dr. Alexander’s conservative and meticulous approach, his patients generally experience a smooth and speedy recovery. As with primary rhinoplasty, swelling, bruising, soreness and discomfort are to be expected. Dr. Alexander will do his best to ensure you are comfortable throughout the entire process. Dr. Alexander provides an in-depth, personalized consultation in the privacy and comfort of his Toronto offices during which he will help determine the best course of action regarding your nose job. This involves a careful review of your nose, examination of previous surgeries, and a frank discussion of your needs and wishes. Dr. Alexander will explain the process to you, mapping out a clear plan for improvement and success. To best prepare for the consultation, it’s a good idea to jot down all your questions and concerns in advance. You may also want to collect images from magazines and websites that reflect your ideal nose. These can help Dr. Alexander understand your aesthetic preferences. The doctor may also employ our advanced computer imaging software to help you visualize the changes. Dr. Alexander is passionate about patient education and awareness. For those undergoing a nose job in Toronto for the second time, this is especially relevant, as the patient may be justifiably cautious after a bad surgical experience. Dr. Alexander does his best to provide you with all the facts, risks, details and surgical information so that you may move forward with confidence and peace of mind. The doctor can also discuss combining treatments, such as revision rhinoplasty and a chin implant or a facelift, for example, which may result in greater cost effectiveness. If you would like to learn more about whether rhinoplasty is right for your aesthetic goals, please contact our office today to set up your initial confidential consultation with Dr. Alexander. During this private session, he will be able to answer all your questions and concerns in detail. Your consultation will begin with an examination of your nose, a review of your previous surgical procedures, if any, and a survey of your medical history. The doctor will then begin to offer a general outline of his treatment plan to address your nasal issues and imperfections. You are welcome to bring photographs from magazines or the internet that reflect your ideal nose. In addition, the doctor may also choose to employ our advanced computer imaging software to help you better visualize your results. If you are considering nose reshaping surgery, we invite you to meet with Dr. Alexander to find out more about the procedure. Your confidential consultation involves answering all your questions and concerns to your satisfaction. Dr. Alexander will examine your nose, review your medical history, and can help you see what various changes will look like with the use of our 3D imaging system. After your consultation, a custom surgical plan will be established, and we will schedule a surgical appointment, so you can undergo the surgery. Our patients tell us that altering nose shape, size, or appearance has been life-changing – they no longer feel embarrassed or shy about facial appearance. 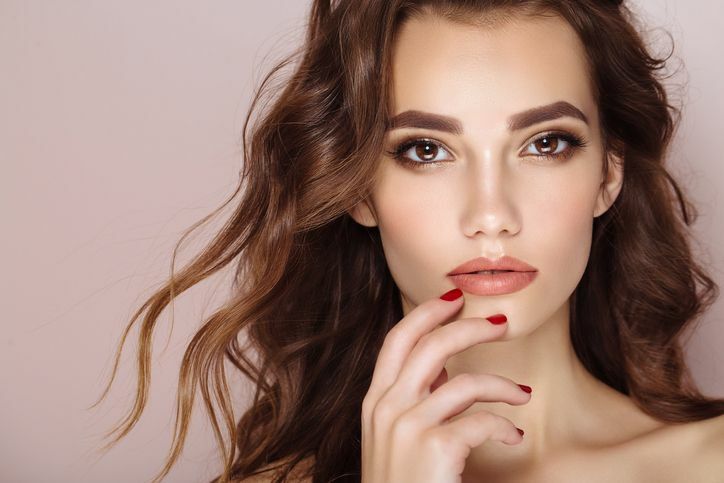 Dr. Alexander can discuss other procedures with you, as for some patients, chin augmentation can create a more attractive overall facial appearance. Other options that you may want to consider include non-surgical enhancements with injectable fillers to smooth lines and wrinkles or bring a more youthful lift. The benefit of performing several procedures in one surgery include lower cost for anesthesia and a single recovery time. Dr. Alexander is known for his high-level skills in facial rejuvenation and is always interested in speaking with you about what is possible with modern aesthetic technology. What Goes into the Cost of Rhinoplasty? When it is performed as an elective cosmetic procedure, health insurance companies do not cover the cost of a rhinoplasty. However, if you have a deviated septum or a nasal structural defect that is affecting your breathing, health insurance often covers some of the cost. Reconstructive nose surgery made necessary because of an injury or illness, such as cancer, may also be covered by health insurance. Our goal is to make every aspect of your treatment experience as comfortable and convenient as possible. We accept all methods of payment, including major credit cards and debit cards. We also offer third-party financing for rhinoplasty and other procedures through Medicard. How Is Rhinoplasty in Toronto Performed? Rhinoplasty is performed under general anesthesia or intravenous sedation. You will need to recover from the anesthesia in our facility and have a friend or family member available to drive you home when released. This surgery is a complex and meticulous operation that typically takes three to four hours to complete. Nose surgery involves manipulating nasal bone and cartilage to reshape and remodel the nose. Grafts may be needed for re-contouring in some cases. Cartilage may be taken from the septum for this purpose, or from another part of the body, such as the ear or a rib. If the septum is deviated and blocking the airways, it can be straightened during a nose job procedure. Dr. Alexander will also reduce projections within the nose structure to improve breathing. Depending on the type and extent of changes that need to be made, Dr. Alexander will choose either an open or closed approach to the surgery. In open rhinoplasty, a small incision is made across the bottom of the structure separating the nostrils to provide the best access and visibility. Incision lines heal beautifully and become virtually imperceptible over time. In a closed rhinoplasty procedure, all incisions are made inside the nostrils. Advantages of this technique include no visible scarring and faster healing and recovery. After an in-depth consultation and careful evaluation, Dr. Alexander can recommend the most effective surgical approach for your nose surgery. Primary rhinoplasty is surgery performed to improve function or appearance of the nose for the first time. It is important to choose your surgeon wisely for primary rhinoplasty, to avoid corrective surgery in the future. Dr. Alexander performs this complex procedure with artistry and skill to produce stunning results that bring balance and harmony to the face. For many surgeons, rhinoplasty is one of the most difficult procedures to perform. Patients often come to Dr. Alexander for revision nose jobs, to correct a poorly-performed previous nose job that resulted in problems with breathing or the appearance of the nose. If your first nose surgery did not produce the results you expected, he can restore the structure of the nose and help you achieve your personal cosmetic goals. 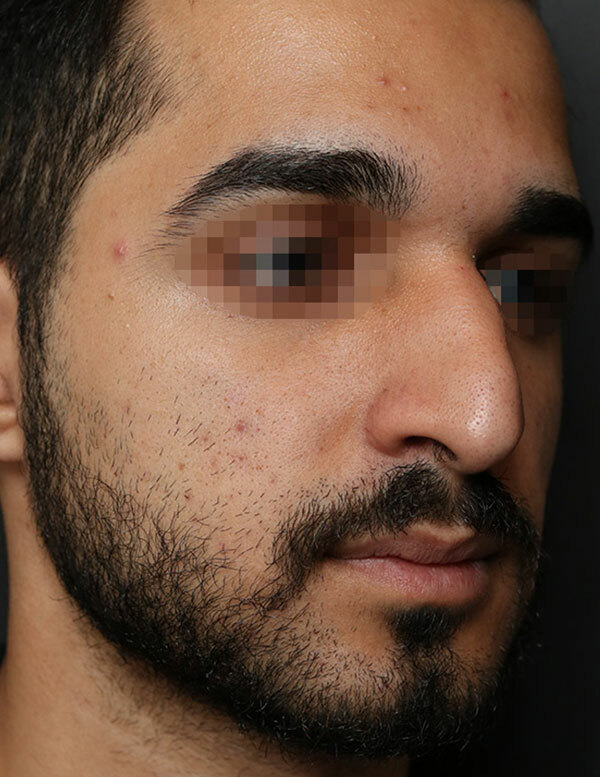 Some patients may be candidates for non-surgical rhinoplasty, a minimally-invasive procedure using injections of certain dermal fillers to improve the appearance of the nose. This treatment may be a good alternative to surgery if you have minor nasal flaws, such as a drooping nasal tip or a slight hump on the bridge. There is no recovery time with non-surgical rhinoplasty, and the results are visible immediately. Nose surgery is performed in the same manner for patients of any ethnic background. The difference with ethnic rhinoplasty is the aesthetic goals of the patient. More people today want nose surgery that tailored to their individual features instead of seeking a Westernized look. For example, many Asian or African-American patients want to correct a bridge that is too flat or nostrils that are overly wide. Dr. Alexander will custom-tailors a rhinoplasty surgical plan to match your individual aesthetic goals. Why Is Revision Rhinoplasty More Expensive than Primary Rhinoplasty? Surgery performed to correct a previous nose surgery presents unique challenges. There may be scar tissue and deformities to deal with. It may be necessary to take cartilage from other parts of the body to re-structure the nose. The nose is the most noticeable feature of the face. Failed nose surgery can be an emotionally devastating experience. Dr. Alexander has the technical skills, training, and experience to restore function and a more aesthetically appearance to your nose when primary rhinoplasty has gone wrong. Why Choose Us for Nose Surgery in Toronto? Dr. Ashlin Alexander is well-versed in minimally-invasive and open rhinoplasty techniques. He devotes the time needed for careful evaluation and meticulous surgical planning to you, as an individual. His technical skills, dedication to surgical excellence, and compassionate bedside manner make him provide some of the best cosmetic, functional, and revision rhinoplasty Toronto has to offer.